Photography puzzle. 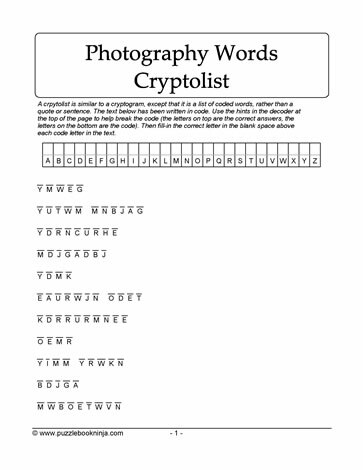 This cryptolist puzzle is related to photography words. It activates problem solving skills because the only clue available is that the topic is related to photography words. Puzzle solvers use knowledge of word families, word structures and patterns to decode the letter combinations and solve the puzzle. Use the table to record letter substitutions. Increases vocabulary building skills. Suitable for everyone!